File - King Salman of Saudi Arabia (R) welcomes Kuwaiti Emir Sabah Al Ahmed Al Sabah upon his arrival to Riyadh Airbase before the opening of Gulf Cooperation Council summit in Riyadh, Saudi Arabia, May 2015. If the newly reached accord between Iran and major world powers works as designed, it will keep Tehran from developing a nuclear weapon for the next decade and beyond. Some analysts say another way to judge the deal reached Tuesday in Vienna is whether it keeps Arab governments, many of whom view Iran as a main rival, from pursuing nuclear programs of their own. Iran is prevented from designing warheads or conducting experiments on nuclear weapons-related technology. 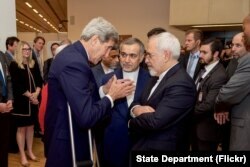 Arms embargo on Iran will be eased, as long as IAEA judges Iran's nuclear program to be peaceful. International sanctions on Iran will be lifted, enabling it to export oil. If an international panel finds Iran is not honoring the accord, it can vote to restore sanctions. Several Arab countries, mainly those in the Persian Gulf, have expressed alarm at the prospect of the agreement essentially allowing Iran to possess significant nuclear capabilities. Saudi Arabia has been the most straightforward in hinting it could pursue nuclear weapons if the pact is not sufficient, heightening fears of a regional nuclear arms race. "This deal implicitly recognizes and legitimizes illicit behavior on the part of Iran for the past 12 years," said Matthew Moran of King's College London. "I think others will be watching this carefully." So far, reaction from Arab governments has been limited, and not overly negative. A Saudi official quoted by the state-run SPA news agency said, "The Kingdom of Saudi Arabia has always believed in the importance of reaching a deal regarding Iran's nuclear program." The official, whose name was not given, said Saudi Arabia is looking forward to better relations with Iran, "based on the principle of good neighborliness and non-interference in the affairs of others." The United Arab Emirates also welcomed the deal, saying it could "turn a new page" for the Gulf. "Iran could play a role in the region if it revises its policy and stops interfering in the internal affairs of countries like Iraq, Syria, Lebanon and Yemen," a UAE official said. The statements suggest Arab leaders are not only interested in the technical aspects of the nuclear deal, but they also want to be sure the sanctions relief and improved ties with Washington do not shift the regional power balance in Iran's favor. "Nuclear deterrence is not the main concern," says Andreas Krieg, a security analyst who has worked as a consultant for the Qatar Armed Forces. "Nobody thinks Iran will actually use a nuclear weapon." "The main concern is that now Iran has the potential, with having the normalization of its diplomatic ties, to become the actual hegemon in the region," Krieg told VOA. Arab leaders have long complained Iran is helping destabilize the region by supporting its preferred militant groups in countries such as Yemen, Iraq, Syria and Lebanon. With billions of dollars freed up by sanctions relief, many fear Iran now will be able to increase funding for those fighters. Krieg doubts whether those concerns will lead Saudi Arabia to pursue a nuclear weapon in the near future. "I don't think a nuclear bomb is going to help Saudi Arabia in a proxy war in Iraq or in a proxy war in Syria," he says. "I'm quite skeptical whether this is going to lead in that direction; but, there is a potential for it. Saudi Arabia is seen as the most likely Arab country to develop its own nuclear program, having both the financial means to do so and already having conducted advanced research in nuclear physics. There are also concerns Saudi Arabia could purchase nuclear weapons from Pakistan, whose atomic program is believed to have been funded in part by Riyadh. President Barack Obama called Saudi King Salman on Tuesday, just after the deal with Iran was reached, according to the White House. A statement said the president affirmed the deal will "verifiably prevent Iran from obtaining a nuclear weapon." He also underscored the United States is "as committed as ever to working with our Gulf partners to counter Iran's destabilizing activities in the region."